Sound emissions of competitive off-highway vehicles manufactured on or after January 1, 1998, shall be limited to not more than 96 dBA, and if manufactured prior to January 1, 1998, to not more than 101 dBA, when measured from a distance of 20 inches using test procedures established by the Society of Automotive Engineers under Standard J-1287, as applicable. 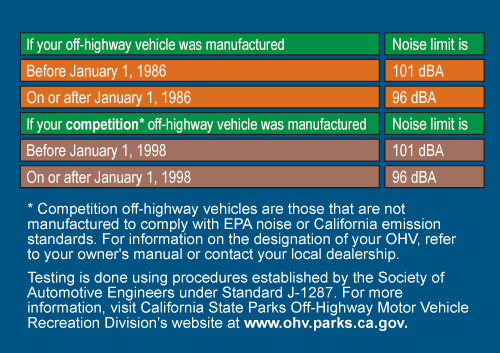 Sound emissions of all other off-highway vehicles shall be limited to not more than 96 dBA if manufactured on or after January 1, 1986, and not more than 101 dBA if manufactured prior to January 1, 1986, when measured from a distance of 20 inches using test procedures established by the Society of Automotive Engineers under Standard J-1287, as applicable. See the Noise Limits Law - AB 2274 web page containing excerpts from AB 2274 relating to OHV noise regulations effective January 1, 2003. For your convenience, Sound Cards are available by phone (916-324-4442) or mail (OHMVR Division, 1725 23rd Street, Suite 200, Sacramento, CA 95816). Download the 2006-2012 Model Test RPM Data Supplement to MIC Stationary Sound Test Manual for Off-Highway Motorcycles, ATVs, & ROVs.